“It’s very chef-y,” said the Food Gal. “It feels like the chef is cooking to impress other cooks.” Indeed, how you feel about all these cheffy impressions will probably depend on how many cartwheels you like to see from a kitchen. Because there is no doubt that much of what you will eat here is tasty, but none of it is what I would call simple. Before we explain the menu, a little background is in order. Sparrow + Wolf is the brainchild of veteran Strip chef Brian Howard – who was last seen doing David Myers’ bidding at the now-shuttered Comme Ca. 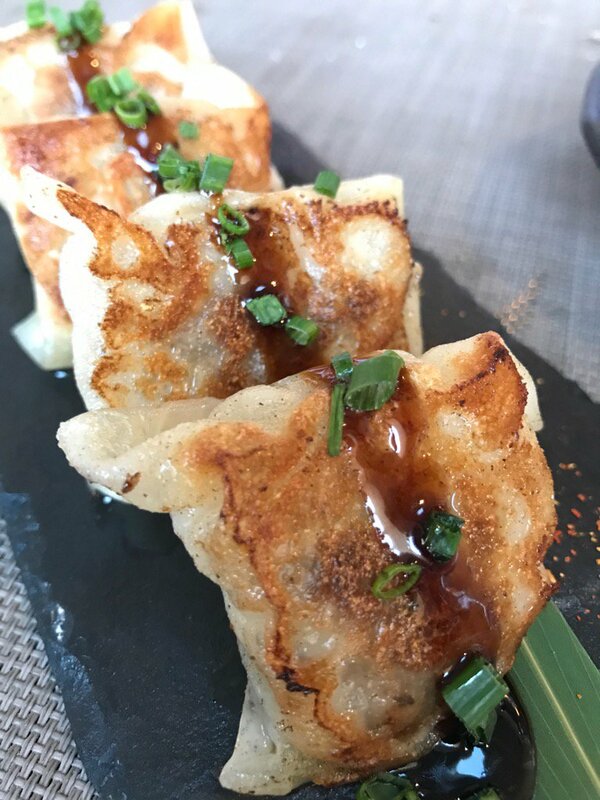 Tired of cooking for tourists, Howard has made the bold move of bringing his elevated world cuisine to the ‘burbs – but not too deeply into the neighborhoods. 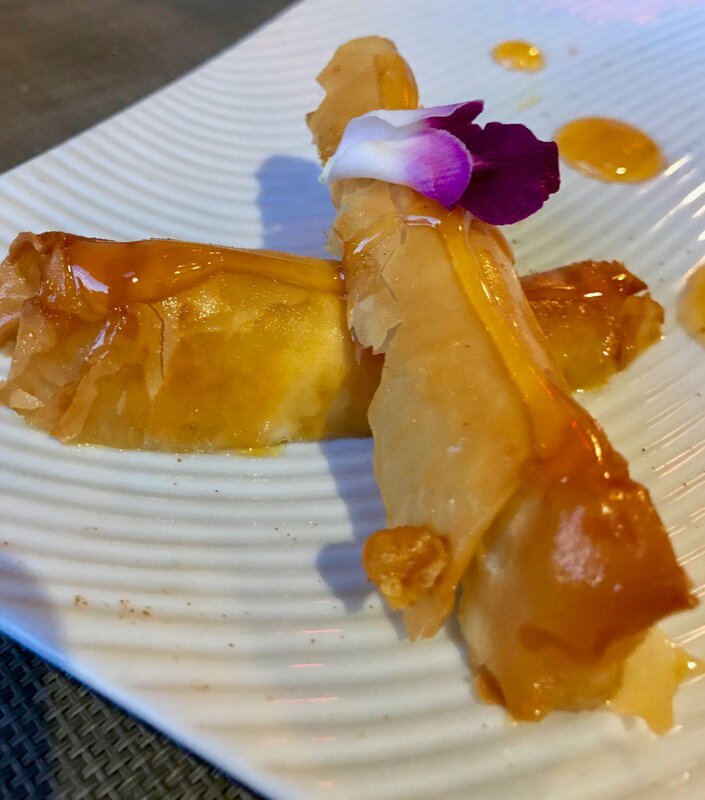 Instead of trying to woo the fickle Summerlin or Green Valley crowds, he’s opted to open on Spring Mountain Road – a mecca for foodies and tourists alike. He’s done it by hollowing out an old pho parlor, cutting it in half, bringing in a wood-burning oven, and creating an open, airy coziness in a space that used to look like a budget cafeteria. There’s a long bench against one wall, and an 8 seat bar that looks into the kitchen. There’s also complicated cocktails and a menu full of things to eat that you have never thought of. For example, who would’ve thought that a tangy, white Alabama barbecue sauce would marry perfectly with a thick slab of halibut? It sounds odd, and isn’t a whole lot to look at, but it’s lip-smackingly good. Ditto the crab two ways: one topped with kimchee, the other a fried egg, or a shallow bowl of sliced duck, with bits of salted cucumbers and a tangle of sautéed mushroom in a sweet-sour plum-duck broth. It’s a dish that sounds Asian, looks vaguely French, and tastes like the best of both worlds. Howard’s food likes to toggle around the globe – as when he stacks his lamb tartare, fresh oysters and charcuterie into bento boxes – and some of the combinations don’t make much sense (Why are octopus tentacles on top of a really good dry-aged steak? ), but once the food hits your palate, you know he’s on to something. Some combinations need work – as when tough, bacon-wrapped cabbage distracts from beautiful sweetbreads – but the hits far outnumber the misses. There are also a few items we’re not sure about, such as the Chinatown Clams Casino at the top of the page (an umami bomb – clams, cream, bacon, uni – tasting like it was dropped from a David Chang menu), and the beef cheek/marrow dumplings are best consumed by a crowd around a roaring fire in the dead of winter, not in 105 degree Vegas heat. Ditto the udon Bolognese: a triple-rich homage to wafuu (Japanese/Italian) pasta that slayed us after two bites. Rib-sticking or not, this is clearly an ambitious restaurant – more aspirational than anything since Other Mama opened. And Howard is banking on corralling the same clientele to his less seafood-centric version of a gastropub. The foodies will flock here for sure, and some tourists will traipse, but will Asians and others adapt to these intriguing alimentations? Only time will tell. Kevin Chong’s Japañeiro is going on 3 years old now. To be perfectly blunt, its survival has always been in doubt to us. Not because it isn’t exceptional, but because it is in an exceptionally difficult location — probably the worst in town for a place serving such fine food. If you haven’t been, allow us to paint a picture for you. On a desolate corner in the southwest part of town there is a strip mall — one of those L-shaped jobs with spaces for maybe 10 tenants. 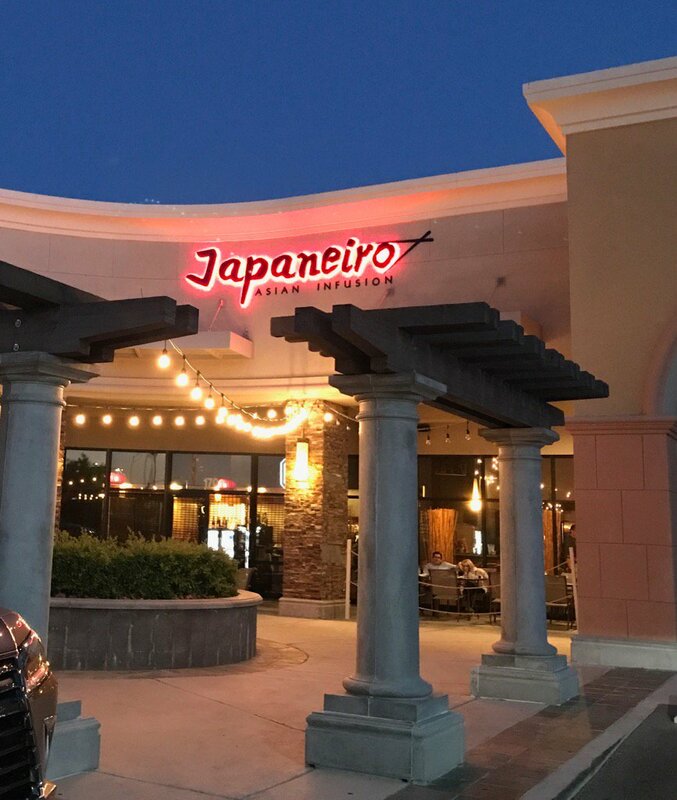 Japañeiro occupies the corner space, while a few other renters hold on, as they weather the various stages of going into or out of business. There is a sad looking video poker bar on the corner pad, and a lot of depressing dust and emptiness on the other 3 corners of Warm Springs and Tenaya. If you were picking the worst place in town to create extraordinary meat and Asian seafood combinations — dishes that would make even the fussiest gourmand sit up and take notice — you couldn’t pick a more dire location. But survive Chong has — against all odds. And how’s he’s done it is by bringing in everything from true Belon oysters, to live Japanese abalone to Kegani Hokkaido hairy crabs in season. He’s done it with technically precise combinations and point perfect cooking. He’s done it by doing Asian fusion food as well or better than anyone on or off the Strip. 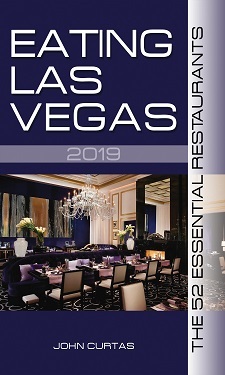 Put it all together and you have one of our most unique, tastiest, chef-driven restaurants — the type of place foodies are always pining for, and that Las Vegas has precious few of. The answer, of course, has something to do with the location, and a little more to do with the price point. This is not the place to come for bargain basement fusion food. 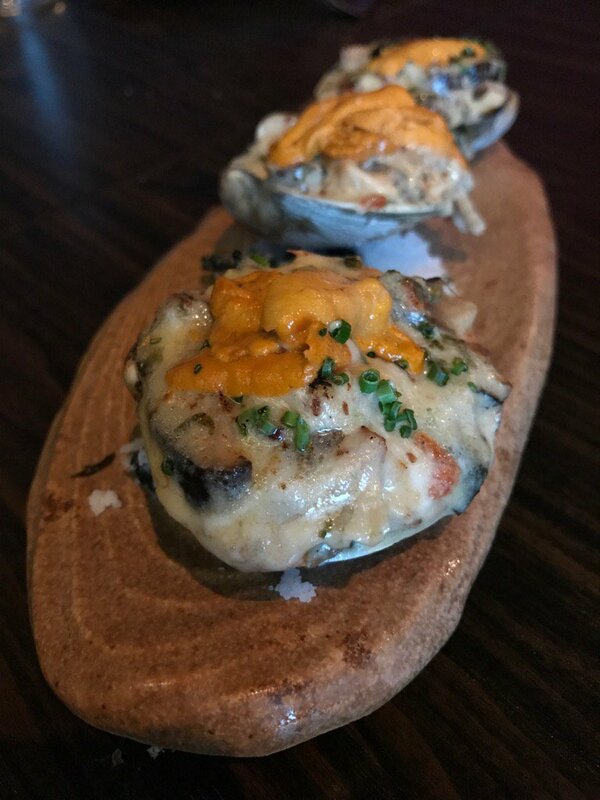 It is the place to come for some of the most unique creations in Las Vegas, made by a chef who’s passionate about what he does. 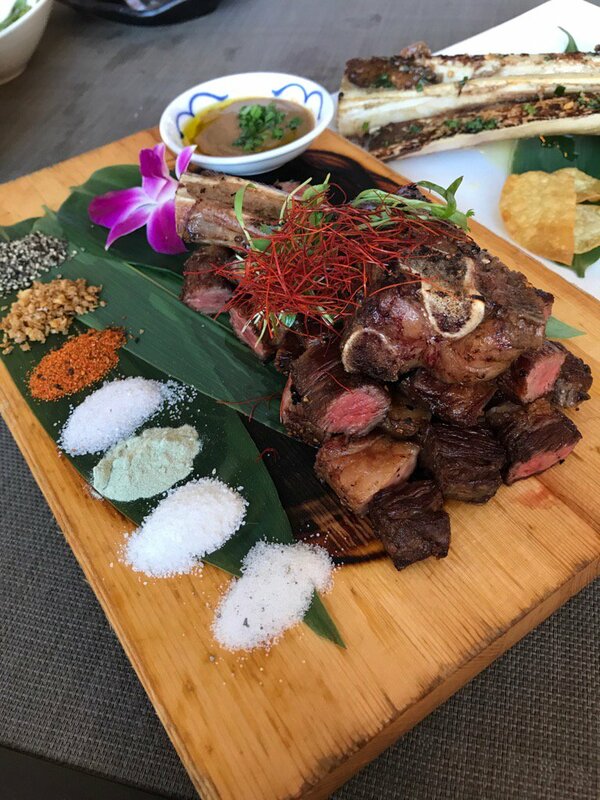 Chong, like Dan Krohmer at Other Mama, is sourcing Strip quality ingredients and giving them an East-meets-West spin that always maintains a delicate balance between creativity and understatement. 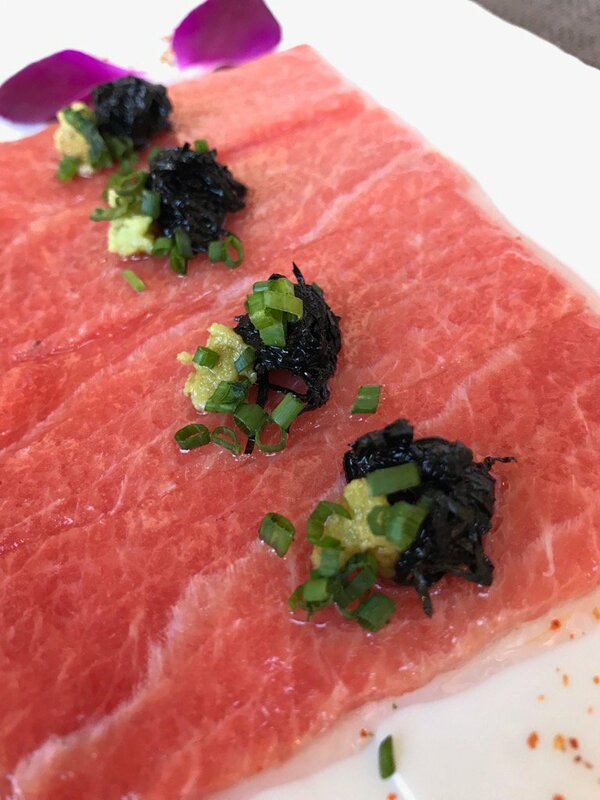 Cooking this fine is worth the tariff, even if a tab for two can get to $150 very quickly — $75 being price of his multi-course omakase dinner. Ordering a la carte will keep things right around a hundy for a couple. Those who blanch at that tariff will be happy to know there’s a happy hour (where everything’s under five bucks), and that the (huge) rib eye (at $65) is a flat out steal. Location or not, anyone interested in interesting food ought to be eating here. ELV’s dinner for two with a bottle of $50 wine came to $200 and we left a $40 tip.